The museum first opened in November 1998 and was renovated in 2016. 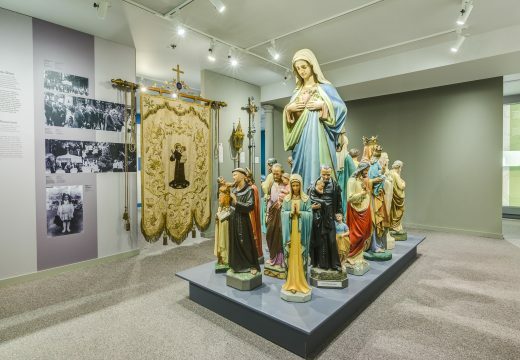 Its permanent exhibition, located in the lower level of the Co-Cathedral of Saint-Antoine, houses nine separate sections highlighting our rich historical and religious heritage. Certain objects on display date back to the earliest days of the Saint-Antoine-de-Padoue Parish, which was founded in 1698. The museum’s 1998 inauguration was the culmination of a nearly three-year effort to seek funding, inventory objects, conduct research, produce a catalogue, and organize the opening. In 2016, committed to make the Co-Cathedral known to future generations, the fabrique decided to renovate the museum and the crypt. Museologists and the Longueuil Historical Society combined their talents and skills to ensure the successful completion of the project. Major partners have already indicated their interest in joining us in this marvelous undertaking, including the City of Longueuil, the Sisters of the Holy Names of Jesus and Mary, The Caisse Desjardins de Longueuil, Member of Parliament Pierre Nantel, and generous private donors. Free guided tours of the church and the museum are available this summer, made possible through the gracious financial support from both the Canada Summer Jobs program and the Saint-Antoine Parish. After this summer, tours may be scheduled through the Marigot Historical and Cultural Society. The Normandy Cross, a rustic religious artwork dating probably from the 15th century, formerly located outdoors among the reconstructed remains of the stone fort’s east tower, has been relocated to the Co-Cathedral’s crypt. The museum is located in the lower level of the Co-Cathedral at 132 Chambly Road in Longueuil. There is no admission fee, however voluntary contributions are appreciated.